The great plains plus, version 1.0 map card has many standard and high definition lake maps for Iowa, Illinois, Kansas, Missouri and Nebraska. 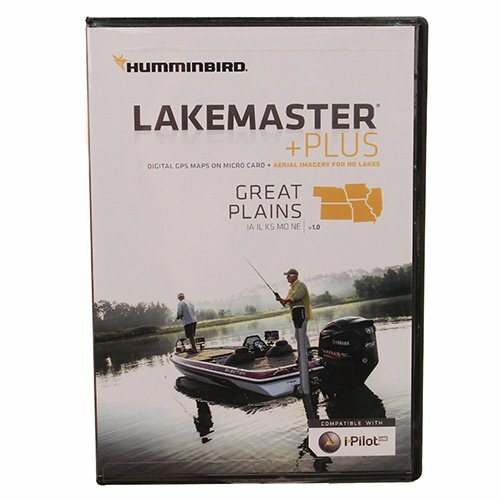 The plus Series allows for aerial image overlay on high definition waters in addition to all of the LakeMaster features. Now you have the ability to use quality aerial photography to view the entry and exits of creek channels, see how far a reef or weed line extends, and pick out shallow water rock piles, steep drop-offs or other features of the lake you've been missing from traditional maps.Features:- gives you the freedom to choose how to view the aerial imagery- Micro card with SD adapter included- waterproof carrying case- does not include aerial imagery for lake Michigan""